…where we present our Halloween adventures in a new era. …was to be a very good tour. Halloween fell on a Sunday and there was no moon visible for most of that week. 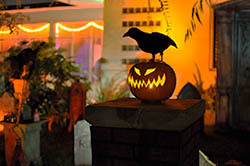 We began our tour on this Saturday before Halloween, to try to see those attractions that would be available on that day and get a good head start on our tour. Our first task, as usual, was to erect the memorial monument. 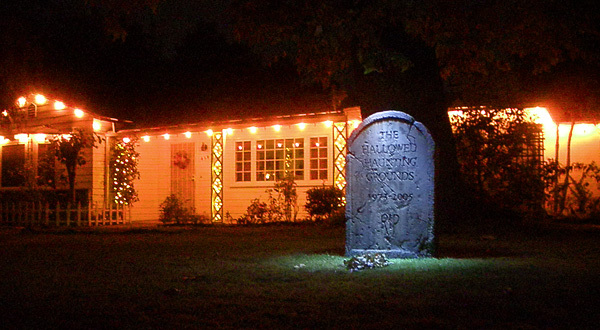 This year the Hallowed Haunting Grounds Memorial Monument would be framed by an experimental lighting technique on the house. The orange lights alternate with black lights - not ultraviolet, but literally black, emitting no light at all. Gary feels that this is a far more traditional color scheme. The rest of the group are in no position to argue. Our first stop was an afternoon event at the North Hollywood Division Station of the Los Angeles Police Department. We had received flyers promoting this free community outreach event and we thought it would be civic-minded to attend. It was an open house event and there was a haunted house attraction set up in the underground parking structure. 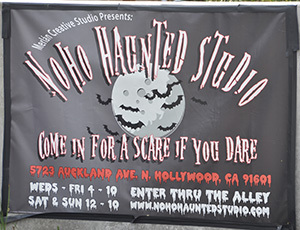 The haunt was apparently produced by a group called the NoHo Haunted Studio. with a Psycho-inspired theme entitled "Bait's Bed and Breakfast." While it was a simple "black-plastic" affair as befits its very temporary nature, the cast was diligent and they did a credible job following through with the theme. It might be interesting to see what they do in there own facility near Burbank Bl and Cahuenga St. in eastern North Hollywood. After touring the haunt we were able to view several displays, including various police mobile command centers and other police vehicles. Also on display were two vehicles that were involved in the 1997 robbery and shootout at the Bank of America branch on Laurel Canyon blvd. 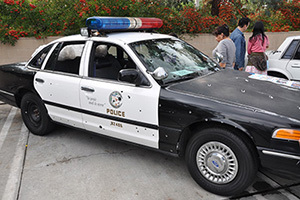 One bullet-riddled police car and the assailants' car were on display. After returning from the police station and gathering the remainder of our tour group, we went for our traditional dinner at The Smoke House restaurant. We had planned to do this a bit earlier to try to reduce our tendency to be late to everything, but, as usual, we were an hour later than planned. Rotten Apple 907 was presenting a "preview night" for its twentieth-anniversary presentation so we next went there to try to avoid the rush. This haunt is so well regarded that there is always a crowd, so our plan was not really helpful, but at least were were not too late. This year their show was Nightmare at the Museum. Diane and Preston and the rest of the Rotten Apple crew are always very gracious to us and we appreciate their hospitality. We felt that this years show was the best that we had seen from them. 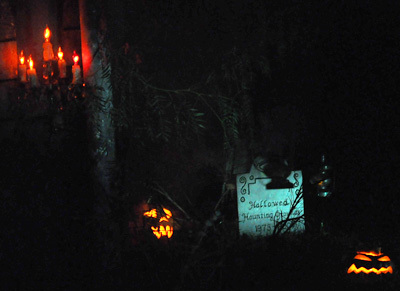 As always, the efforts of the haunters were well-realized and the theme was carried through completely. The pacing and structure were excellent, and the acting, props, and effects were all top notch. The finale scene (a spectacular T-rex come to life) was well worth the wait in line. We were pleased to make contributions to their charity for 2010: Family Service Agency of Burbank. Our next stop was the Ghost Train. Each year the Los Angeles Live Steamers railroad club decorates their entire main line for the season. Our first observation was the generally foggy atmosphere, which might have been natural given the park location, but was actually a rather hyperactive theater smoke machine bening used in the outdoor venue. 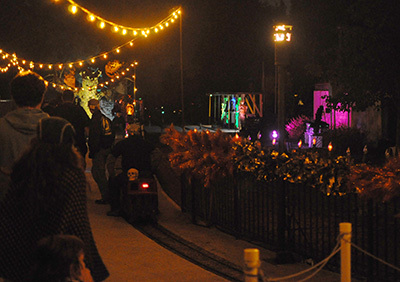 Because the route is about 1½ miles long there is much space to fill, so the many vignettes cover just about every Hallowen and horror genre. Riding through the darkness under the control of others causes a feel unique to this attraction. The displays and the ride are fun and well worth the donation. It can be very busy, so arrive early and allow time. We were amused to note that a scene in the queue area included material of our Sounds of the Hallowed Haunting Grounds CD. It is not too surprising that they show up occasionally as many of our friends and fans that present these local haunts have the disk. Our final stop on that Saturday was Old Town Haunt in Pasadena. This commercial haunt is the last vestige of the former Spooky House empire. 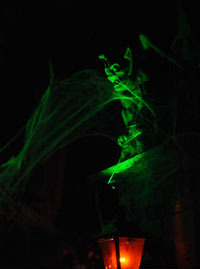 Ron Rogge has been running this haunt for several years. He is doing a fine job and we appreciate his hospitality and birthday greetings for Gary. For a while some of our old special effects had appeared in this show, but they are all gone in favor of the truly dark and creepy. These are experienced characters. Steve was particularly affected by a silent, staring, long-haired girl. Well done! The first Sunday was reserved for our major theatrical event for the season. 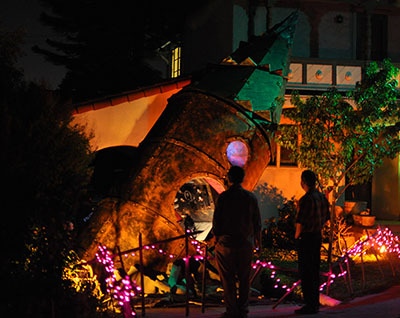 Following a quick and tasty meal at The Oinkster in Eagle Rock we headed to Altadena for the evenings performances by Wicked Literature: A Halloween Theatre Festival. 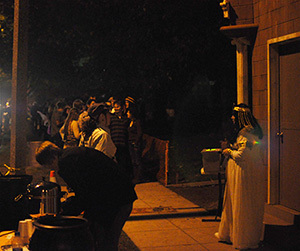 Wicked Literature began as a playreading series and in 2009 produced a set of short plays at the Greystone mansion in Beverly Hills. 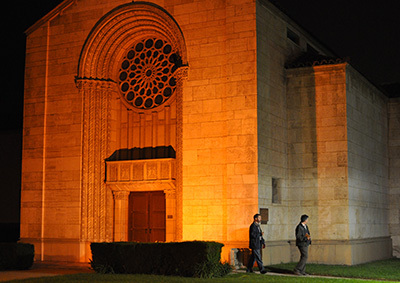 This year their venue was the Mountain View Mausoleum and Cemetery in Altadena. We were impressed by the creative use of the venues for the three productions. The use of scale, distance and darkness while walking through the cemetery during The Unnamable was amazing, the chapel was well suited for the production of The Chimes, and the mausoleum nicely evoked the catacombs of The Cask of Amontillado. The performances were all convincing and enjoyable. We could not take photos during the performances, but there are several at the Wicked Lit website. It will be very interesting to see what this group does next year. On Wednesday Gary made an excursion to the Magic Castle where he met this character from Mr. Dead's Underground. Our seasonal exploits continued the following weekend with a quick bite at Brat Brothers on Ventura Boulevard. Mark likes wieners, and it seemed a welcome variation on the October 30th tradition of grabbing a hot dog while trying to get that evening's manifestation of the Hallowed Haunting Grounds up and running. Anyway, the brats were wunderbar. Then it was on to Canoga Park to visit Matt and Lori's technically extravagant House at Haunted Hill. We always return to witness the latest Revenge of Lily. Once again, the high volume of onlookers compelled the closure of their street to all but foot traffic. A glowing tweet from an impressed Neil Patrick Harris resulted in an even larger turnout than one could have anticipated. Magnificent as always, the show featured many subtle and not-so-subtle improvements of both a technical and esthetic nature. We chatted briefly with both Matt and Lori, and assured them we were planning to return the next night to make them the grand finale of our annual gallivanting. Passing back through Encino, we attempted to drop by the Haunt with No Name… Yet, but for us and our faulty memories it was the Haunt with No Address. We vowed to correct our oversight and return on Halloween night with the proper location in hand. 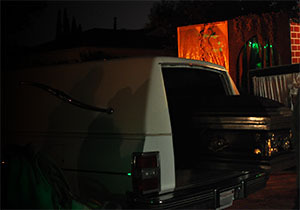 Our attempt to stop by Bob Baranick's skeleton-filled haunt in Van Nuys proved equally unsuccessful. Having found the location, we had failed to note that he had taken the year off. We were consoled, however, by an understated display around the corner. 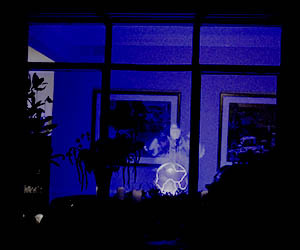 Then it was on to West Hollywood and Mark's Seance Window. 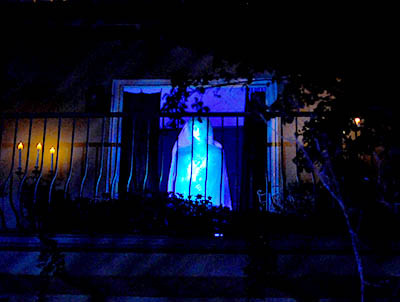 Lighting impresario and friend Mark Andrew had devised a marvelous Peppers Ghost effect for passers-by to enjoy from the sidewalk in front of his West Hollywood apartment. Interactive between projected and live lighting effects, the scene offered several variations within its eye-catching routine involving a seance medium and an enormous crystal ball. Graciously, he invited us in and afforded us a behind-the-scenes glimpse of the impressive set-up. It was like our Nursery Girl effect on steroids. Excellent work, Mark. We ended our Halloween Eve evening in Santa Monica at the beautiful, creepy, unabashedly subtle House of Restless Spirits. As always, we were running late, and Eric was just getting ready to power down so that he could begin that all-too-familiar routine of "tweaking" the show in preparation for the next night. As tired as he must have been, he patiently escorted each of us in the HHG crew scene-by-scene, effect-by-effect through those marvelous, eerie, restless grounds. Needless to say, it was a perfect ending to our Saturday night sojourn. 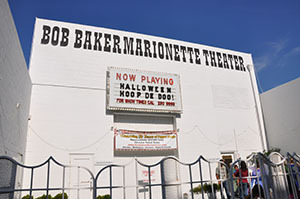 Halloween day's activities began early (for us) with a Sunday matinee on the Halloween Hoop-de-Doo at Bob Baker's Marionette Theater near downtown Los Angeles. 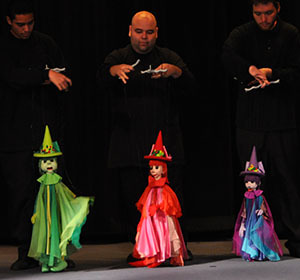 The extravaganza featured a variety of Halloween-themed songs and dances performed by Mr. Baker's extensive cast of puppets and puppeteers of every shape and size. For several in the HHG gang, the outing marked a return of sorts, having last visited the theater (now a historic landmark) many, many years ago in our various youths. 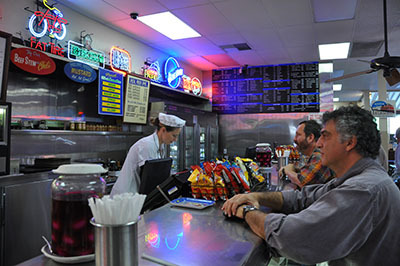 Of course, we couldn't leave downtown L.A. without grabbing a pickled egg or two at Philipe's. 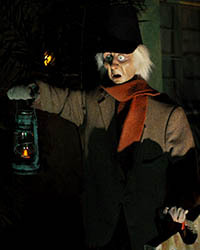 Soon we found ourselves en route to see James Lopez's annual Haunted Mansion Northside. 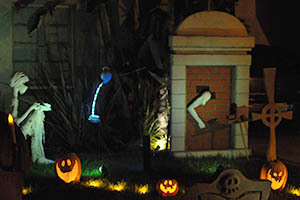 Once again, he had captured the style and certain charm of the famous Disneyland attraction right there in his own front yard. His budget is probably fairly much as ours had been — $0.00. Still, he always does a remarkable job, and his admiration of Disney is evident, right down to that hauntingly spirited soundtrack. It is our understanding that Mr. Lopez has been lending his considerable talents to our friends at Rotten Apple 907. Next, we were off to Peter Montgomery's home in Glendale. Sporting a different theme each year, his displays are always quirky and fantastic, and 2010 was no exception. From the driveway, viewers were treated to the mind-boggling sight of a steam-punk "mechanical mole" having just broken through the ground in front of them. Within the whirring, whirling machine sat a flustered skeleton and his raven co-pilot arguing about whose fault was the mishap and what to do next. Bizarre and unquestionably otherworldly, it is always worth dropping in on Peter's wonderful work. For a change of pace, we decided to swing through Toluca Lake in hopes of catching glimpses of families with little ones trick-or-treating around their neighborhood. We found them, alright -- about a million of 'em. In hindsight, we really should have been on foot, and the popularity of the area offered us little in the way of parking options. Seeing so many wee ones in their little tiny costumes, along with all of their friends and relatives, was a nice reminder that there is more to the season than just elaborate high-tech haunts. That said, we were off to Toluca Haunt. 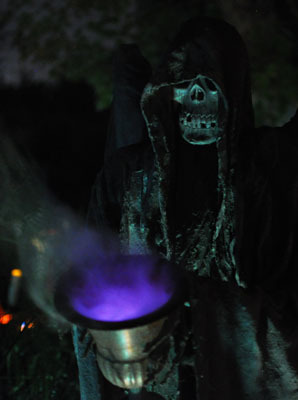 A volunteer-run, kid-manned walk-through, presented by a family that are active members of the Southern California Haunters' Society (CalhauntS). It was an interactive homage to the classic "jump and scream" approach to storytelling. Although not our particular forte, a frightfully fun time was had by all. 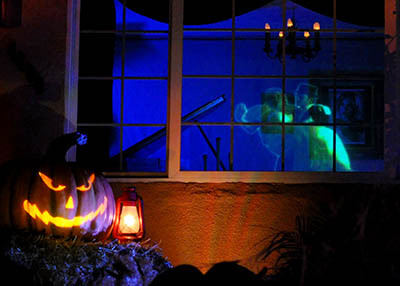 We then travelled back to the west to visit what we call the Studio City Peppers Ghost House. An intriguing plethora of grave markers, crypts and cobwebbed chandeliers surround the home. 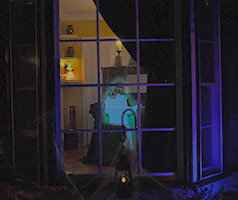 Through the front window, one discovers the ghostly apparition of a little girl practicing the piano. It's a beautiful Peppers Ghost effect reminiscent of our own Organist, and the way she looks over her shoulder at you is downright spine-tingling. Well done! As the evening hours were slipping away we met up with some more friends and family as they visited Rotten Apple 907 in Burbank. The crowds had again turned out in record numbers and we were pleased to see the queue moving so well. It is always fun to introduce friends to quality productions. 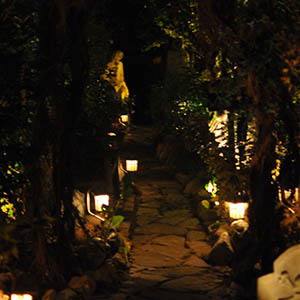 Second time's the charm, or so we hoped as we sped back to Encino to find the Haunt with No Name… Yet. 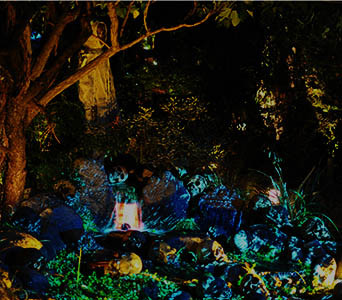 Having researched the address and directions helped significantly, and soon we were enjoying that quintessential yard haunt — with no name yet. As we milled about, taking in all the etherial details, we noticed a little marker off to the side bearing the epitaph "The Hallowed Haunting Grounds." Needless to say, we were moved. Although we may deny it publicly, a tear or two was shed over that unexpected and touching tribute. Thank you, friends, from all of the HHG team. As is our habit, because we really want to see and absorb everything that we can, we race to beat the closing times of many venues. In that spirit we sped out to West Hills to visit Forest of Mirrors. By the time we arrived the show was closed and the cast dismissed, but the owners generously allowed us to walk through the unique environment. In the back yard of this home one moves through the darkness, along foliage-canopied paths that seem to extend indefinitely due to large strategically-placed mirrors. 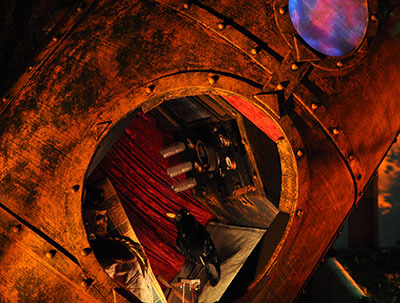 Combined with lighting effects and projections, the experience is unlike any other we have encountered. Following a flat tire repair that put another dent in our already crushed schedule, we returned to Canoga Park for the last performances at Matt and Lori's House at Haunted Hill. 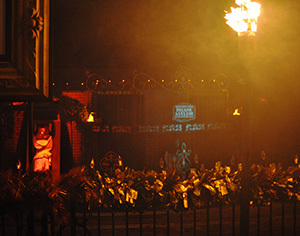 The show looked and sounded better than ever, and served as a fitting finale to our Halloween 2010 tour. All and all, not a bad year. 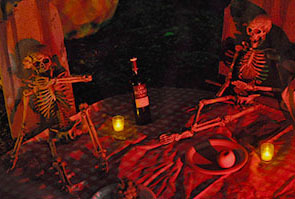 Our thanks and congratulations to all who contribute so much effort to keep the modern Spirit of Halloween undead.